Nexen Tire America has officially kicked off the 2019 Formula DRIFT season with this year’s Nexen Tire Motorsports Formula Drift team. Nexen Tire Motorsports introduced its team at the season kick-off event – Formula DRIFT Round 1: Streets of Long Beach – April 5-6 with all drivers running laps on Nexen Tire N’Fera SUR4G street-legal drift tires. 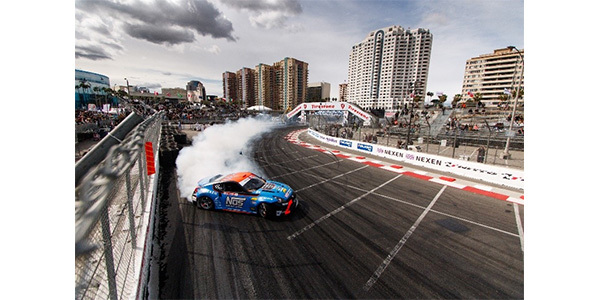 When the smoke cleared, Championship Formula DRIFT driver Chris Forsberg piloted his NOS Energy Drink / Nexen Tire Nissan 370Z to a third-place podium finish. Nexen Tire Motorsports teammate Fredric Aasbo, driver of the Nexen Tire / Rockstar Energy Drink Toyota Corolla hatchback, trailed closely but ended up in fourth place after a blown engine during the semifinals. The performance of all drivers helped Nexen Tire finish the event in second place in points for this year’s coveted Tire Cup Championship. This performance is a continuation of Nexen Tire Motorsports’ success throughout the 2018 Formula Drift Season, in which its drivers earned several wins and podium finishes, including four drivers finishing in the top 10 in points. The 2018 season concluded with nine podiums total, Aasbo with two victories and six podiums total and Forsberg with one victory and a third-place podium. Aasbo’s second-place finish in the final race helped secure second place in overall driver standings for the year. Nexen Tire also came close to winning the 2018 Tire Cup Championship but had to settle for second place, just a few points out of the lead. During a busy off-season, Nexen Tire Motorsports said it continued attracting some of the most talented drivers in the sport, which includes the addition of Federico Sceriffo, who pilots a Formula DRIFT prepped Ferrari 599. It features the same Nexen Tire N’Fera SUR4G drift tires that other teammates rely on. Nexen Tire Motorsports also added drivers Austin Meeks and Jeff Jones.